Sermon Theme: Better Than Christ? Summary: Rather than complain about circumstances — a likely theme for most of us who might find ourselves unjustly imprisoned — Paul took opportunity to celebrate the opportunities for proclaiming the Gospel, even as his arrest continued. While “the whole imperial guard” may never come to faith, Paul certainly had an advantageous position to tell them of Jesus, who had died to save them from their sins. This begged the question in my own mind: What is better than Christ? Nothing — except more Christ! Continuing to live meant continuing in the Lord’s mission. Death meant entry into eternal life with the God who’d saved him from his reckless earthly paths and from an eternity of hell. Paul therefore cautions us to avoid clinging too tightly to the things of this earth at the expense of storing up heavenly treasure. At the same time, he also reminds us to remain faithful to our God-given vocations for as long as we live. Text: I want you to know, brothers, that what has happened to me has really served to advance the gospel, so that it has become known throughout the whole imperial guard and to all the rest that my imprisonment is for Christ. And most of the brothers, having become confident in the Lord by my imprisonment, are much more bold to speak the word without fear. . . .
For I know that through your prayers and the help of the Spirit of Jesus Christ this will turn out for my deliverance, as it is my eager expectation and hope that I will not be at all ashamed, but that with full courage now as always Christ will be honored in my body, whether by life or by death. 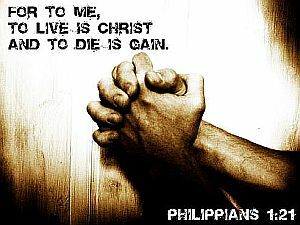 For to me to live is Christ, and to die is gain. If I am to live in the flesh, that means fruitful labor for me. Yet which I shall choose I cannot tell. I am hard pressed between the two. My desire is to depart and be with Christ, for that is far better. But to remain in the flesh is more necessary on your account. Convinced of this, I know that I will remain and continue with you all, for your progress and joy in the faith, so that in me you may have ample cause to glory in Christ Jesus, because of my coming to you again. Audio: Click to hear the MP3 of Better Than Christ?, preached to the saints of God at Our Redeemer Lutheran Church, Marshall, Missouri.